Hunter Vanwert of Evergreen, center, surges to the finish in the 4x100 meter relay at last year’s regional meet in Tiffin. Three of the four members of that relay return after advancing to state a season ago. The Evergreen track and field team has high hopes for the 2019 season. Head coach Jared Walker is especially excited about his boys squad that returns a bevy of letter winners. 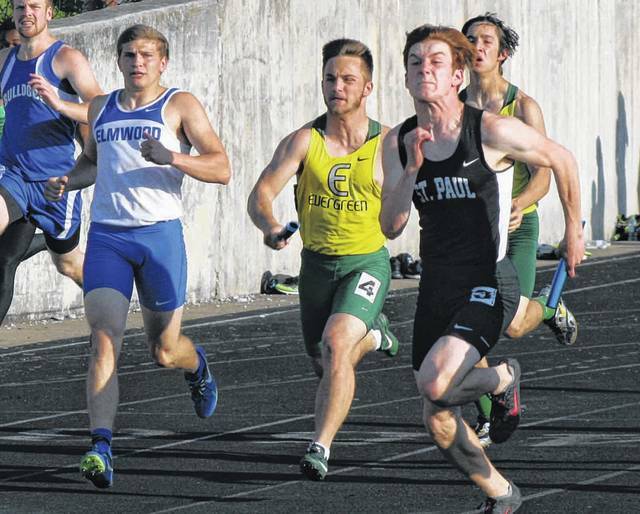 Their most notable returnees are Hunter Vanwert, Reece Serna, and Drew Donnald, all of whom were members of the 4×100 meter relay team that advanced to state in 2018. Vanwert was also league champion in the 100 meter dash at the Northwest Ohio Athletic League Championships, while Serna brought home a league title in the 200 meter dash. Other returning letter winners for the Vikings are Jack Worline, Colten Pawlaczyk, Chandler Ruetz, Alex Majewski, Will Smithmyer, Shane Ruetz, Tristan Cordray, Will Dumas, Colin Smith, Levi Moore, Auggie Tipping and Jacob Ruggs. They will also have newcomers Lane Schoendorf, Austin Pennington, Jack Etue, Mason Loeffler and Anthony Sanders. The Vikings will have to replace Grant Donnald, the fourth leg of last year’s 4x100m relay, along with Nick Hassan. Strengths for the Vikes are with their sprinting events, relays, and throws. A weakness Walker notes is in the long jump. With a few teams competing for the top spot in the NWOAL, the league meet should be exciting. On the girls side Evergreen will be lacking depth but should field a competitive group. Back for the Viking girls are Asia Gensch (all-league), Savannah VanOstrand (all-league), Morgan Foster, Kyiah Harris, Jordan Lumbrezer and Emily Herr. They only lose Courtney Krieger. Newcomers looking to add depth will be Andrea Vanwert, Lindsey Wade, Casandra McCullough, Brianna Sintobin, Jenna Mossing, Mackenzie Mitchey, Kayla Gleckler, Gracie Boger, Alivia Eisel and Amy Ruetz. From that group of returning letter winners and added newcomers, the Vikings will be strong in hurdle events, distance, and the high jump. The main weakness for them is depth. Coach Walker hopes his girls improve enough throughout the season for a nice finish at the league meet and beyond. Hunter Vanwert of Evergreen, center, surges to the finish in the 4×100 meter relay at last year’s regional meet in Tiffin. Three of the four members of that relay return after advancing to state a season ago.